(Nanowerk News) A novel way of making 3D nanostructures from DNA is described in a study published in the renowned journal Nature ("DNA rendering of polyhedral meshes at the nanoscale"). The study was led by researchers at Karolinska Institutet who collaborated with a group at Finland's Aalto University. The new technique makes it possible to synthesize 3D DNA origami structures that are also able to tolerate the low salt concentrations inside the body, which opens the way for completely new biological applications of DNA nanotechnology. The design process is also highly automated, which enables the creation of synthetic DNA nanostructures of remarkable complexity. 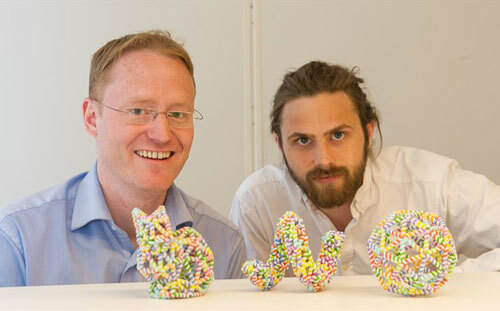 “For biological applications, the most crucial difference is that we can now create structures that can be folded in, and remain viable in, physiological salt concentrations that are more suitable for biological applications of DNA nanostructures,” explains Dr Högberg. “An advantage of the automated design process is that one can now deal systematically with even quite complex structures. Advanced computing methods are likely to be a key enabler in the scaling of DNA nanotechnology from fundamental studies towards groundbreaking applications,” says Professor Pekka Orponen, who directed the team at the Aalto University Computer Science Department.